Are stock market returns linked to economic growth? The immediate answer would surely be, yes. After all, what investors are looking for when they invest in emerging markets is higher growth. 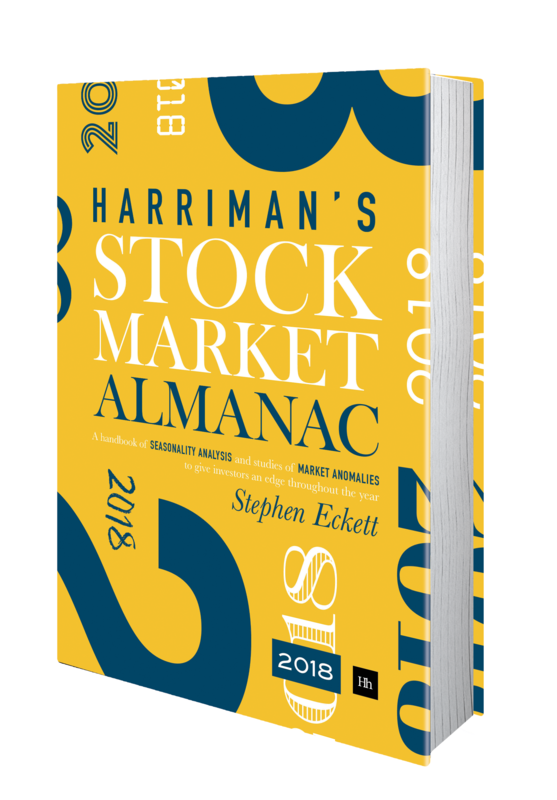 However, a book published in 2002 , Triumph of the Optimists, found that long-term stock returns were negatively correlated with growth in per capita GDP. The authors of that book, Elroy Dimson, Paul Marsh, and Mike Staunton of the London Business School have investigated this seemingly odd result further in their latest report for Credit Suisse (reference below). In the new report the authors first observe the positive correlation between population growth and growth in aggregate GDP – countries generally become wealthier in aggregate as population expands. They investigate whether high-growth economies keep growing and if economic growth is persistent. They found no evidence for significant momentum in economic growth (which is a problem for investors whose strategy relies on jumping on trends in high-growth markets). They conclude that economic growth is “higgledy piggledy”. Considering the problems of forecasting GDP growth, and the lack of a direct link between growth and market returns, some investors have concluded that economic growth is not useful to investors. The authors say that this view is a misinterpretation of their previous work. The authors investigate in some detail the exact effect on the corporate sector of economic growth. The report ends by presenting the two following charts. 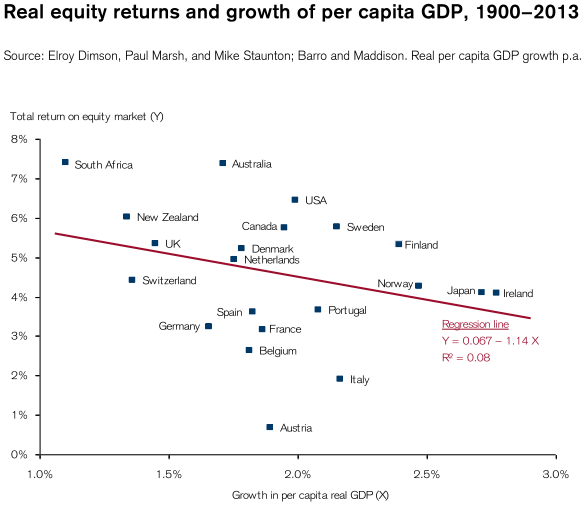 The first correlates real equity returns and GDP growth per capita (1900-2013). 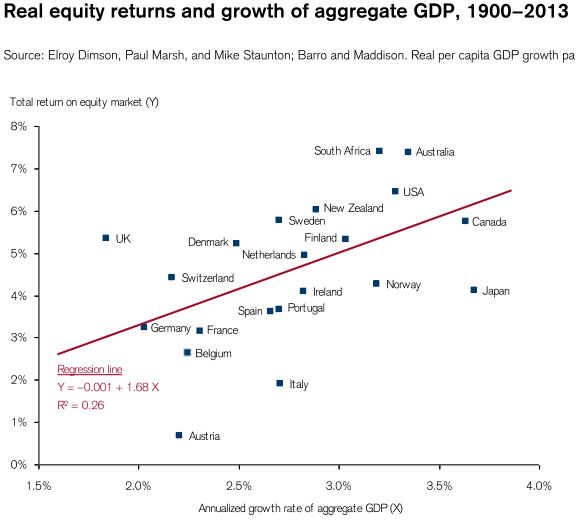 As can be seen, there is a negative correlation between GDP growth per capita and equity market returns. The chart below is similar to that above but looks at aggregate GDP instead of per capita GDP. Although there is a positive correlation here, the authors conclude that this offers “little evidence of an investment opportunity”. The report concludes by saying that although it is difficult for investors, stronger GDP growth is generally good for equity markets. Stock markets predict changes in GDP, but movements in GDP do not predict stock market returns. Companies in growing economies become less risky and therefore offer a lower expected return. Investors bid up the prices of growth assets; and to arbitrage global mis-pricing is anyway difficult. Luck. If a country is lucky to have resources and that is already priced in the market, there can be no expectation of enhanced returns.